I'm so angry that I missed this one on the big screen. I feel like Denis Villeneuve must have sat down and had a Captain America instructional film playing that said, "So, you've been hired to make a three-decade belated sequel to an almost universally fawned-over sci-fi film...now what?" His answer, Blade Runner 2049, is an extraordinary balancing act. It spends an obscene run time properly mimicking the atmosphere, pacing, and light existential dread of Ridley Scott's 1982 original, but it also manages to expound upon the first film's plot and themes, expanding the perspective through the eyes of new characters, and resonating on a higher emotional level than the first film's admittedly anemic characterizations. It also is nothing short of a visual marvel. It's a gorgeous piece of sci-fi candy with a surprising amount of satisfaction and invention inside, all the while honoring the bud from which it bloomed. Villenueve is simply one of the great masters at work in cinema right now. 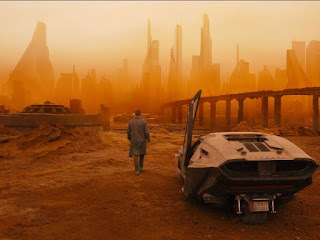 While Blade Runner succeeds still today as an arresting tone poem filled with vague ruminations on free will, evolution, and what it means to be human, it was a cutting-edge 1980s film with a plodding 1970s sense of time management. Scenes sit uncomfortably silent and motionless for minutes at a time, and the now iconic tech-noir production design couldn't help overshadow the frustratingly simple detective story. Villeneuve's sequel improves upon a lot of this without denouncing the storytelling tactics that Scott employed. Ryan Gosling stars as a new LAPD officer charged with "retiring" rogue synthetic people known as replicants. But the story has more weight when grounded in consequence and context; in the three decades since the first film, there has been a replicant revolution, the Tyrell Corporation has been dissolved, and while Harrison Ford's Deckard character was mired in ambiguity about his humanity, Gosling's Officer K is not...he's a replicant, and no one will let him forget it. The plot has far-reaching, world-changing stakes at the end of K's investigation that sends him in search of Deckard, not just for answers in his case but sub-textually for personal fulfillment and guidance. Gosling's performance as K functions as something of a reprisal of and comment on Ford's original. While Deckard's arc seems to be a post-modern question of finding (or rekindling) humanity, K is the post-post-modern answer that a non-human protagonist can display the most human qualities. Gosling's usual smolder is put to work in combining the predatory Roy Batty with the jaded Deckard, but also with a touch of the vulnerable Rachael. Ford's return as Deckard likely would have had much more impact if kept a secret instead of pushed forward in the film's marketing, but the sometimes curmudgeonly former leading man gives a contemplative, reflective performance that I wasn't sure he was still capable of. Just as with the original film, the supporting cast does a great deal of heavy lifting to fill in the world surrounding our largely quiet protagonist. Robin Wright and Mackenzie Davis create such palpable, enigmatic inner monologues that speak to the film's thesis statements. Dave Bautista showcases his future as a dramatic actor, while Sylvia Hoek channels the unstoppable uncanny valley of Robert Patrick's Terminator 2 performance as Luv, the replicant tasked with thwarting K's investigation. 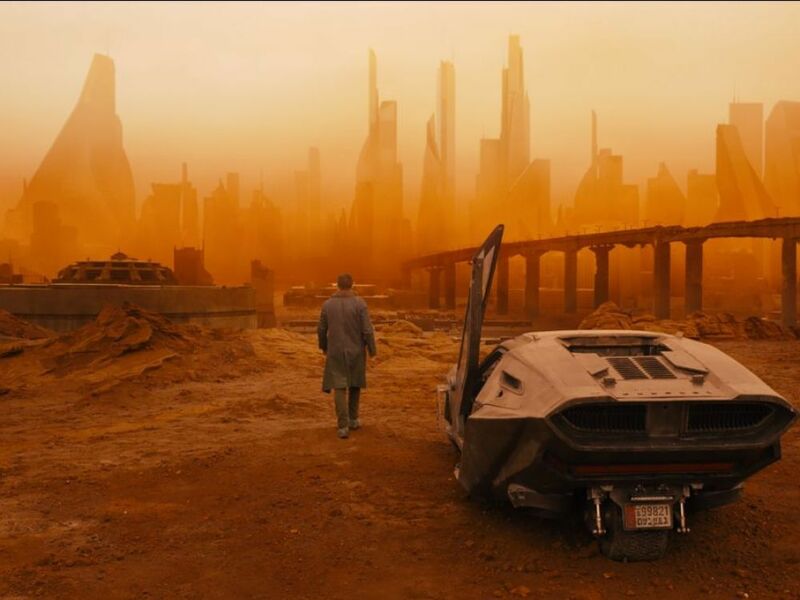 While the plot and characters dig deeper, Villeneuve and cinematographer Roger Deakins do not let the visuals slack for even a moment. I'm sure I'm not the first to declare the neon-soaked Los Angeles cityscape or the gleaming golden graveyard of Las Vegas as anything short of breathtaking. It's a book of concept art come to life. I have to gush a little more, even, over the smaller touches of production design that sell concepts to the audience that would easily become shaky. The ceiling-mounted hologram generator that projects K's artificial intelligence girlfriend, Joi, is startlingly plausible. The clean-room quarantine of K's routine command-phrase restart process is appropriately cold and dispassionate, echoing the mood of the Voight-Kampf interviews from the original with a more machine-gun delivery. And there's a climactic fight that, without giving too much away, plays with claustrophobic and panoramic spaces so well that my heart continued to sink all the way down to my heels with the helpless isolation accompanying the brutal choreography. All the other stuff you've heard? Yeah. It's long. Really, really long. It feels as long as it actually is. But there's a purpose to that. And yes, it does contain Jared Leto, giving a very patented Jared Leto performance. But it works. Put it this way, if the idea of more Blade Runner interested you at all, you need to dive into this one because it's a shiny, timely upgrade that still demands just as much from you as the first film and rewards you in kind.